I have been having a look at the beta of Unity3d 3.0 for a while, but nothing is as good as it going gold and live. It comes packaged with a wonderful looking demo called Bootcamp. There is a version of the demo (with a bit of an in game cutscene before getting to the 3rd person part. The simplicity both of getting Unity3d running, i.e. its nicely self contained means you can just dive in and make things. There are some new scripts to help like a 3rd person script and a new demo character with animations of a construction worker. It really could not simpler, yet there are tonnes of features for the more pro focussed game programmer and graphic artist. 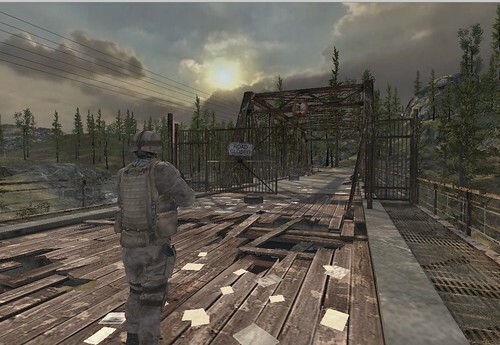 The demo uses a very large terrain with lots of detail and debris. 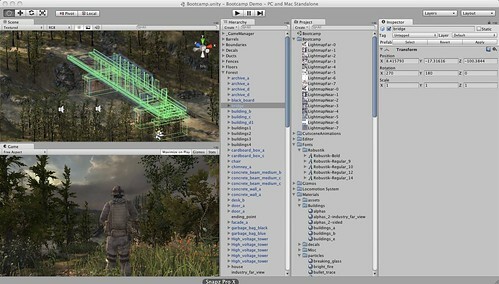 The player character is using a locomotion system to animate over and around the obstacles. Physics is in full effect if you enter the derelict building and start shooting at windows and cans. Things deform, break and fly around. Its all just sitting there on your hard drive ready to explore and see how its all created. There are some handy hooks into MonoDevelop to allow editing of code, breakpoints and inspection as we have got used to on other development platforms. In true Unity style it just works. If you have not already downloaded the free version, and you are in anyway a techie or designer go and get it now ! It really should be something in every school IT lesson too. The ability to make things happen with real programming behind it will make more kids get to understand programming and the sciences behind that. I really wish we had had this when I was starting out, so now I want everyone to go have a go look. Tonight The Cool Stuff Collective episode 3 aired. Recording shows 3 and 4 was the second time in the studio and everyone seemed much more relaxed. 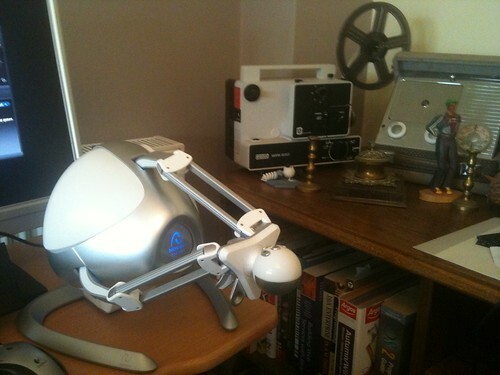 This was just as well as I had a Parrot AR Drone copter to fly around the studio and hassle Sy with it. I had not really considered the extra pressure of flying in a confined space, keeping the Drone somewhere near where it needed to be and chatting with Sy remembering the key bits of script. The trouble is the thing is so much fun to fly and the show is so mad it does make that all very possible. Video feeds from the iphone are not possible, though there are some Linux hacks to do it. However and the great @andypiper had both let me practice with his AR drone and telling me how to do a screen cap of an iphone which all gave the team at Archie Productions more cool stuff to edit in. Now there would have been a time when I would have just gone and bought and AR drone but if I go around buying everything that turns up on the show my fledgling entrepreneurship would end up in bankruptcy. I totted up the other day just in the 4 we have recorded to far the gadgets I have borrowed add up to about £16,000. Though having said that it is amazing that the tech we have is getting to be so accessible to those with good disposable income. Friday is another recording day, and I hope it runs smoothly, with a hint of panic too. 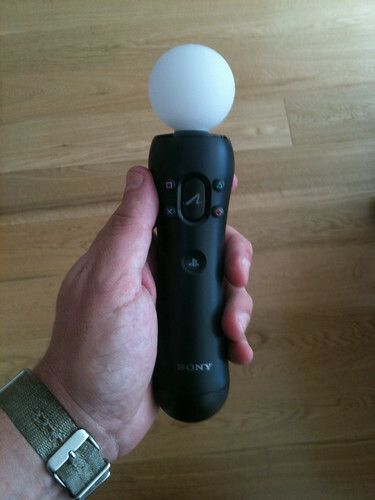 I have to admit to having been a little dismissive of the Ps3 Move controllers. I should have known better really as if I get that dismissive feeling I usually dig a bit deeper to consider why and find the gem I am missing. In this case it took getting a Move controller in the house and playing with it. 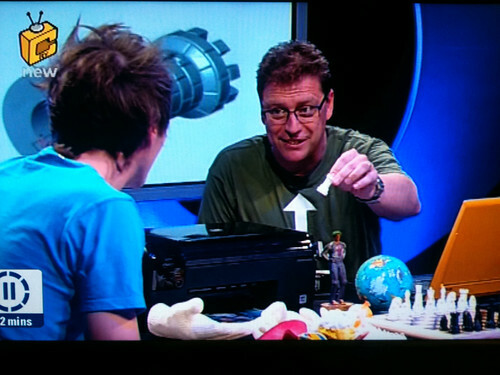 I had only really seen the table tennis game we had on The Cool Stuff Collective show, which whilst it is great seemed very Wii like in what it did. Yes you have brilliant control over the bat but conceptually it is the same. Anyway on Saturday the predlets and I wandered into our local Best Buy and I thought we should get 2 controllers. Already having a camera and a few things like eye pet that could be upgraded it was worth it. You have to charge the things up of course, but as you have to wait several hours for updates and demos to down load there was time for a charge. Whilst mentally I have been all about Kinect on the 360 and the fantastic full body motion capture it does for control the Move controller really does some things that the Wii mote cannot do and to some extent that Kinect cannot do. The Wiimote acts more as a 2d pointer, it does not deal with depth in the same way as a Move does. In addition the move is keyed into the camera. So the experiences are able to put you in the environment and then it is able to track the controller and replace it on screen with something else. See below with the foam hand. This feedback loop is most noticeable in Eye Pet. The previous incarnation used a tracking marker of card that you moved around the augmented environment. It worked, but it you turned the card at an angle you would loose tracking (as the marker was 2d an obscured). The glowing move ball and its accelerometers know if you twist turn or angle the controller any direction and you can see that on screen with the augmented item. This makes eye pet even easier to use. It is more obvious to hold the glowing ball than a flat piece of card. The predlets got straight on with eye pet and were able to do even more and play the games better, so Move is worth it for Eye Pet alone. This direct connection to the onscreen environment and the blended augmentation of the magic mirror effect does not feature in all games though. However one feature that felt great is in the downloadable game Tumble. This is a block stacking game, a clone of Boom Blox on the Wii which allows for a good comparison of the evolution. Tumble shows the Move as a laser pointer on the screen, but when you pick up a block you have to reach in and out of the screen as well as move in the 2d plane to stack the block. As you place the block you feel the very subtle feedback of the rumble pack. It is haptics lite but with the visuals and the physical activity the feedback loop is very believable. 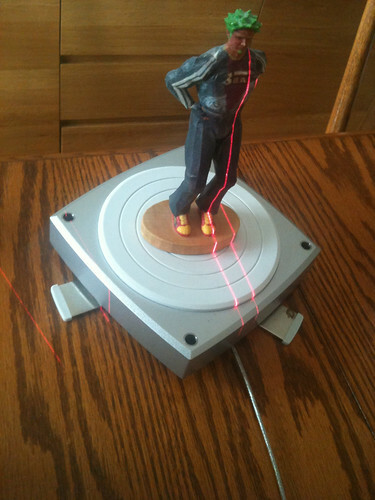 It is this feedback that Kinect will not be able to do. Obviously in a dance game on Kinect the feedback and avatar on screen movement will immerse but you will not feel anything from other experiences. In addition this Tumble game is 3d enabled (which I we are not yet!) but I ca imagine the 3d depth combined with the physical movements and tactile feedback will make this incredibly immersive. Another tactile element to Move is the fire button in a “light gun” game. In some of the point and shoot games a trigger to press is very satisfying. So you can see there is more to the comparison of Move and Kinect and Wiimote than meets the eye or hand. Finally I got Resident Evil 5 as a Move compatible version. I don’t really like zombie games and whilst I appreciate the wonderful nature of Res Evil it always seems the controls CapCom use are counter intuitive. With the Move this was the same. The trigger is user to aim the gun and the thumb button to fire. In addition whilst this says Move compatible the boxes need to be a bit more clear whether you need 2 glowing ball controllers or 1 glow and one movement. Res Evil needs a joypad to move around. You can hold a six axis controller in your left hand and grapple with movement but really the smooth way is the extra extra controller. Not clear from the box (though obvious in some ways of you know the game). As Res Evil is quite a tricky game dealing with odd controls and not just shooting stuff meant it was not a great experience out of the box. I will persevere though. It is a pity there was not a better line up of games at launch. Something that seems to be a very Sony thing to do. Lots of coming soon 2gb demos to wait to download (or on a disc if you buy the camera with the controller). However, I like it now, it has a place and it will do some very interesting things IMHO. I recently joined the panel at the Train for Success event in Second Life where we (Anders the host, Dusan Writer, Maria Korolov and myself) were there to discuss the pulling back from pure enterprise firewalled virtual world solutions by Linden Lab and a focus on the consumer experience. In part of that we talked about the various game related technologies that come into play in delivering a virtual world. Lots of the focus, quite naturally, is on the front end though I did point out the challenge of any MMO is the server based synchronization. In many ways we can get a browser or client to do all sorts of wonderful immersive stuff but its much harder to share a lag free experience and distribute to those clients. It was interested to take the role of the “techy who knows a bit about game platforms”. 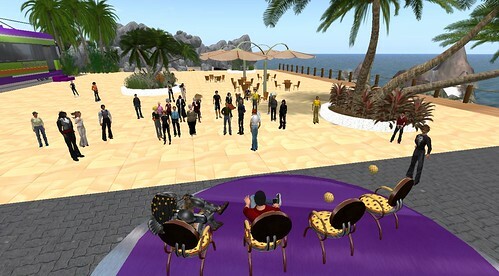 All of us responded in pretty much the same way that yes enterprise SL was not packaged and sold right, nor given the time to evolve but that we all use Second Life still as we blend business and social in so many ways. It was where I started to get traction with my colleagues and customers in 2006. At the end we got onto what needs to extend to an even more interesting conversation as whilst the technology can continue to evolve and get better, faster etc it is the things we do with it and the creative endeavours that create interest and engage people. Whilst there was an uphill battle to get the more mainstream business people to get over the apparent frivolous nature of avatar mediated communication this next wave is really go to scare them and challenge them. Many of the IT departments and policy makers have decided “We don’t play games at work on our PC’s” that is the mantra used to block the use of anything remotely interesting. It is not without some reason, but the seed of reason grows into a giant forest of objection and darkness. 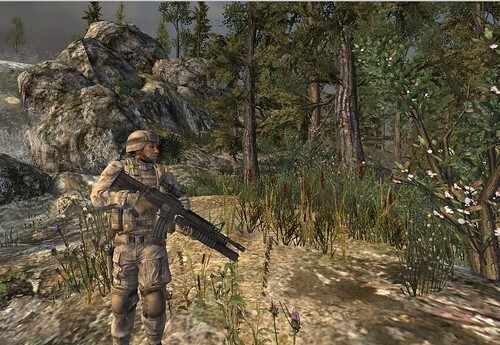 Explaining, or showing that places like Second Life and Opensim etc are not games, just game technology used for another reason doesn’t always chop down the forest. Now of course there is the gamification wave. The implementation of game mechanics and ideas into every application and walk of life. Business is a game, saying the right things to get that promotion is a game, getting the promotion is a badge earned and worn, winning the sales competition and going on a jolly is like a rewarding cut scene after a tough mission. Many of these game mechanics, remembering the IT department “we don’t play games at work” mantra will not even touch any of the IT systems in a way they will notice. An Alternate reality campaign inside a corporation may use the phone system, emails, noticeboards etc. All hiding the game elements as a payload inside everyday tools. At some point though, someone, somewhere, is going to say why cant we do this in a wonderful hi rez generated environment? Why cant we use gesture control like Kinect to navigate the sales figures. It is a conceptual revolution with a massive social impact, as much as social media and the web. Screwing together plates on a production line is very hard to alter as a physical process to make it less soul destroying. Motivations of speed and efficiency and money for the worker help but ultimately it gets automated. The digital chores we make for ourselves clearly can be altered, you have a family photo as a backdrop on your desktop as a start. There is a great article from the Harvard Business Review here I know statistics don’t work for the closed of mind as they will discount things that do not meet their believes but this is an interesting quote. Game mechanics motivate and entertain people. People pay to play games that are chores. Surely its in all the more straight laced and ROI induced business people to look at what they and their people do and see if they can spruce it up a bit. Bored or scared people are going to just do the least they need. Motivated and excited people are going to do great things. So straight laced serious business people who use ‘this is the way we have always done it” whats the point of that…. people the ball is in your court (oh look another gaming/sporting reference). 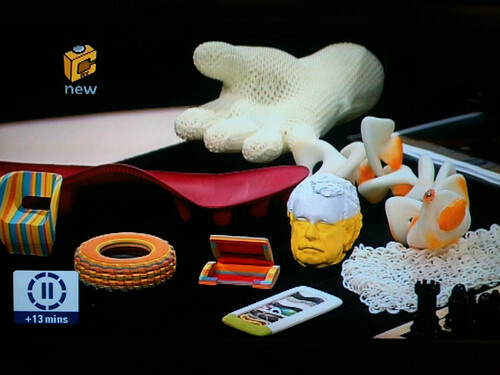 The first programme in the Cool Stuff Collective series aired last night at 5pm. It was really interesting to see how it all looked edited together and themed as I had only seen bits and pieces of the studio elements getting created. I have to say I felt more nervous than usual as unlike live performances at conferences there is no adjusting or steering of the piece. Its done, recorded and locked away. Odd though it might seem live seems easier as you are in the right frame of mind. When we got to future tech and my piece with Sy it felt a little like the drop on a roller coaster. There were so many other things we could have said or put in the piece but it was the right length and pace for the show so I am really happy with it. You may not have noticed but an old friend was in the shot with me. My Fabjectory statue from Second Life in 2006 wearing the striped leather jacket was right by me for luck. We had some great pieces to show. Many of the ones from the VFlash printer were incredibly detailed, the other prints were on screen too from MCOR, Shapeways and London College of Fashion. 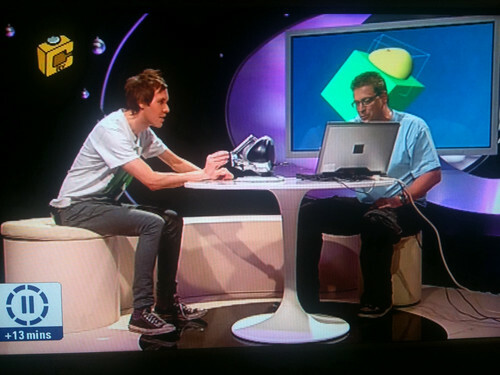 It was also cool that http://www.citv.co.uk was available with the live stream for everyone. Just in case you missed the show or want to see it again it is repeated fri 5:30pm Sat 4:30pm Sun 11:30 am on CITV. The next show airs next monday 5:00pm. Everyone at Archie productions were so friendly and welcoming that doing this was a real pleasure. It was amazing to see how much Sy Thomas had to do all day too. I don’t think I saw him take a rest all day. He was constantly in the studio trying different takes of reaction shots and the script was being adjusted all the time too. I did not envy him having to present, act, listen to his earpiece an deal with the autocue as well as having a tv n00b like me turn up with weird stuff to talk about. Just to answer a few questions though. 1. 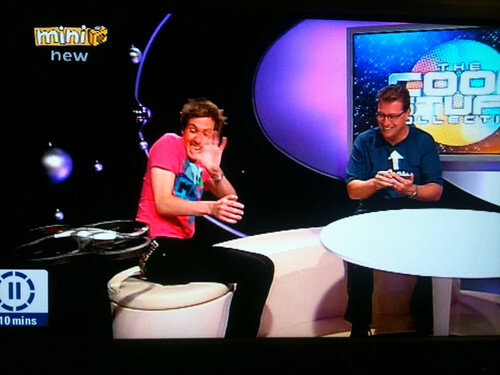 No I was not the monkey, both Matt’s from Archie had that pleasure. 2. No I don’t have an agent. 4. Yes I will stop going on about this one day. 5. Yes I guess I get to keep my Minor Celebrity status after all. A very neat application surfaced this weekend via tweets by @robotduck. An official Vodafone F1 application lets you build the profile of a track you race from the roads on google maps. Its called Hometown as they clearly have spotted most people will razz around racetracks near their own homes. Not only that they let you add extra furniture to the tracks, landmarks and barriers, including yout own text banners. After recording the Cool Stuff Collective second episode using the Haptic 3d device it made sense to get one and see what the predlets, and maybe their school, could do with one. Whilst the haptic show does not air until 20th September I thought it was worth sharing some initial impressions of ownership. Basically it awesome ! The Falcon has a self contained set of mini games and tutorial demos. Although windows drivers tend to be a bit of a pain if you follow the right instructions it dos just work first time. The initial demo lets you feel a number of textures and forces rough, smooth, magnetic, rubber, honey etc. It makes for a very impressive feel for the potential. Here is the Falcon nestled with some much older tech gadgets. The Falcon is quite a large device but sits on a nice sturdy base. It needs some weight to be able to offer resistance and not zoom across the desk. The footprint is about the same as the old microsoft sidewinder force feedback sticks I used to have for Combat Flight Sim. On Cloud9 I dived straight in and in time honoured tradition “it all started with a cube”. I pushed, prodded and deformed the cube both from the outside and from the inside too. The video shows the resulting modified cube, then it published to Unity3d as an OBJ file. Finally it shows predlet 1.0 having a go. It really is very intuitive and very compelling to model with. I have a few ideas of things I want to try but like any modelling tool that also needs some inspiration and talent. As the creation can be exported as OBJ (or STL if you want to 3d print them) then can of course be put into other 3d packages to have extra effects applied. Now when are Second Life going to sort out meshes 😉 I can generate some very organic structures then even as a techie. If you want to see the actual unity3d spin around it is here I published it from the free windows version as my Mac paid for version is on the version 3 beta and so cant publish to the web yet. People sometimes moan that the user contributed web is full of rubbish, but whilst that may be true it does mean that talent shines out more. I have been enjoying the occasional watch of Mystery Guitar Man’s work on youtube. It is deceptively difficult to create edits like this. I love the use of annotations at the end too. Many of us have the equipment and software to create great video and music now. So the fact there is an open and free distribution channel (i.e. the web not just YouTube) is fantastic.